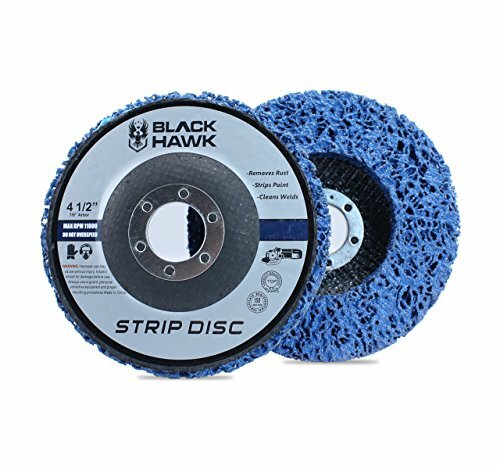 4.5" Black Hawk Easy Strip Discs are the perfect choice for cleaning and stripping metal surfaces. Simply attach to your angle grinder and these discs allow you to remove scaling, oxidation, or clean up weld lines. These strip discs are extremely veratile and are specially designed to strip quickly with minimal under material loss. Each Black Hawk Stripper Disc is made with premium blue (extra coarse) non woven, nylon webbing adhered to an extra strong fiberglass backing. The blue webbing is the new and improved webbing material, offering a longer life and improved cut rates compared to Black colored Clean & Strip Disc. Black Hawk Strip N Clean discs are a safer alternative to wire brushes. Easy Strip and Clean discs are great for auto body shops needing to remove paint and under coating while still protecting the vehicle body. If you have any questions about this product by Black Hawk, contact us by completing and submitting the form below. If you are looking for a specif part number, please include it with your message.